Bending over backwards giving you the wedding jitters? Yes, we are talking about the "paye laagoon" situation at Indian weddings that can be the cause of major backache, literally! We feel your pain dear Indian brides and grooms. You might over hear Pummy aunty complaining about how kids these days have dropped their 'sanskar's right down their drinks. "bado ko pari pauna to banta haiji khud ki shaadi pe, nai?" Now, you'd like to save up on the energy (wink wink), be hospitable and still keep your guests happy? Not happening. Chose your battles wisely, we say. 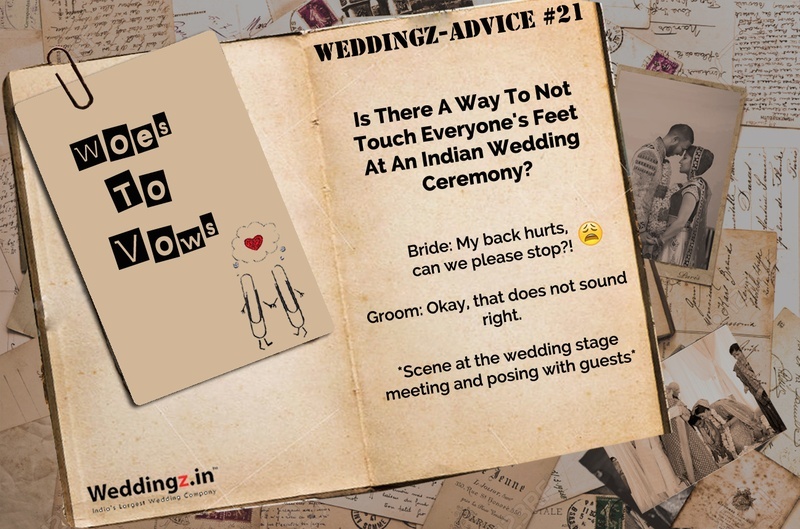 So, how do you avoid touching feet (aka power yoga session that involves a 1000 surya namaskars over the course of the evening in a 50 kilo lehenga and 100s of kilos of jewellery) of those never ending guests standing in your wedding receiving line and in the process ensure you don’t offend anyone? Read on as we share some light-hearted suggestions. The rule of thumb here is to keep a straight posture and a standard pose to welcome each and every wedding guest equally. At Indian weddings, there is nothing better than a Namaste to show sheer respect and gratitude to all young and old. This one is for select wedding guests - the ones who think they are too young to get their feet touched. The typical response - they move a few steps back as you dive toward their feet, giving 'em a miss. They might then come closer and try to hug you, a gesture you might miss. Avoid that ackward confusing greeting zone between the feet touching, the bear hug and the handshake. Stay safe by keeping your hands folded and then go with the flow. Rather than going the whole 'Sashtang Namaskaram' route on your elderly wedding guests, try to reach for the knees. Chances are, most people will just hold you by the shoulders and spring you back up. This way you swiftly make your move, showing them the deserved respect without tiring yourself. If all hell breaks loose and you just can’t take it anymore, become dramatic. Overdo "touching feet" action Take cues from Hindi soap actors for exaggerated facial expressions. Throw big hints that indicate the onset of a migraine, a muscle pull or a fainting spell and you might be spared the torture. Get your sass on and set some rules straight! "Humare ghar pe ladkiyan pair nahi chooti!" If you haven't heard this one before, time to use it now. Boys, please figure it out for yourselves. See a guest approaching? Keep your gun of compliments ready and loaded to aim and shoot. This ammunition is the best distraction to that surya namaskar ritual. There is little that a compliment cannot conquer, in this world. In this case, your health and sanity! And there you have it! Fun and creative ways to avoid the unwanted excercize at your wedding. But hey, share the love we say, cos' it's your wedding day. It really doesn't matter how. Have more great ideas to share? Drop in your comments below.